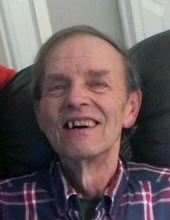 James Leslie Fritz, age 74, formerly of Westminster MD, passed away Friday, January 4, 2019 at Hanover Hospital. Born September 18, 1944 in New Windsor, he was the son of the late George Charles and Dorothy Virginia Grim Fritz. He was predeceased by his wives, Karen Fritz in 1985 and Mary Virginia Fritz in 1999. Jim was a 1962 graduate of Francis Scott Key High School. He retired from Southern States working into management and later as a sales rep, and then worked for the City of Westminster, retiring after 10 years. He was a member of Stone Chapel United Methodist Church, where he served as treasurer and sang in the choir. In earlier years Jim enjoyed playing men's softball and golfing. He also enjoyed bird watching, gardening, and especially loved his cats, caring for any cat in need. Surviving are his daughters, Robin Fleming and husband Shannon of Hanover and Krystal Strine of Westminster; son, Chris Fritz and wife Kristie of Taneytown; stepchildren, Wayne Stonesifer and wife Christine of Middletown, Tom Stonesifer and companion Judy, and Terri Stonesifer, all of Westminster; nine grandchildren; sister, Bernice Ecker and husband James of Westminster; brother Daniel Fritz of New Windsor; and numerous nieces and nephews. In addition to his parents and wives, he was predeceased by a sister, Sharon E. Fritz in 1963; and sister-in-law, Sharon Watson Fritz in 2015. The family will receive friends at Hartzler Funeral Home, 310 Church St., New Windsor on Monday, January 14 from 5 to 7 p.m. and on Tuesday, January 15 from 10 to 11 a.m.
A funeral service will be held at the funeral home on Tuesday, January 15 at 11 a.m. Rev Dr. Steven Cho, his pastor, will officiate. Interment will follow in Stone Chapel Cemetery. Memorial contributions may be made to the Humane Society of Carroll County, 2517 Littlestown Pike, Westminster, MD 21158. To send flowers or a remembrance gift to the family of James L. Fritz, please visit our Tribute Store. "Email Address" would like to share the life celebration of James L. Fritz. Click on the "link" to go to share a favorite memory or leave a condolence message for the family.